Click on the images to enlarge them. All photographs, text, and formatting and captions are by Jacqueline Banerjee, who took the photos before restoration work (completed in 2010). You may use the images without prior permission for any scholarly or educational purpose as long as you (1) credit the photographer and (2) link your document to this URL in a web document or cite the Victorian Web in a print document. Click on the images to enlarge them. 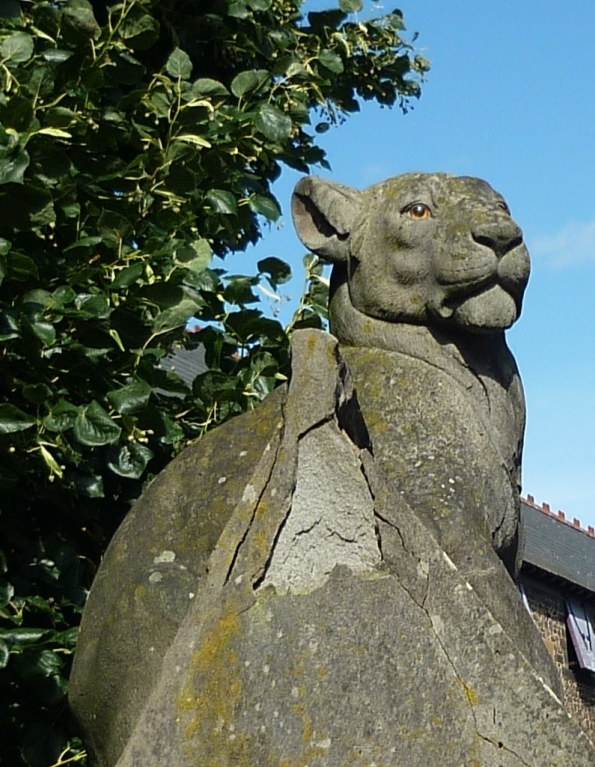 Lioness and Seal, or Sea Lion, on the Animal Wall, Cardiff Castle, Wales by Thomas Nicholls. 1891. The Animal Wall borders Bute Park on the approach to Cardiff Castle. It used to stand outside the castle itself, and was then embellished with nine stone animals, an intriguing assortment of creatures designed by Burges in typically humorous fashion, and carved after his death by Thomas Nicholls in 1891. As David Williams says, Nicholls has given them "their expressive faces and poses" (33). As well as the lioness and seal shown here, there are two separate lions each holding a shield, a lynx, a bear, a pair of apes or monkeys together (these look like a mother and child), a wolf, and a hyena. The animals were originally painted, contributing to their lifelike and characterful appearance. This was just the kind of thing that Burges clearly enjoyed planning and Nicholls just as clearly enjoyed carrying through. 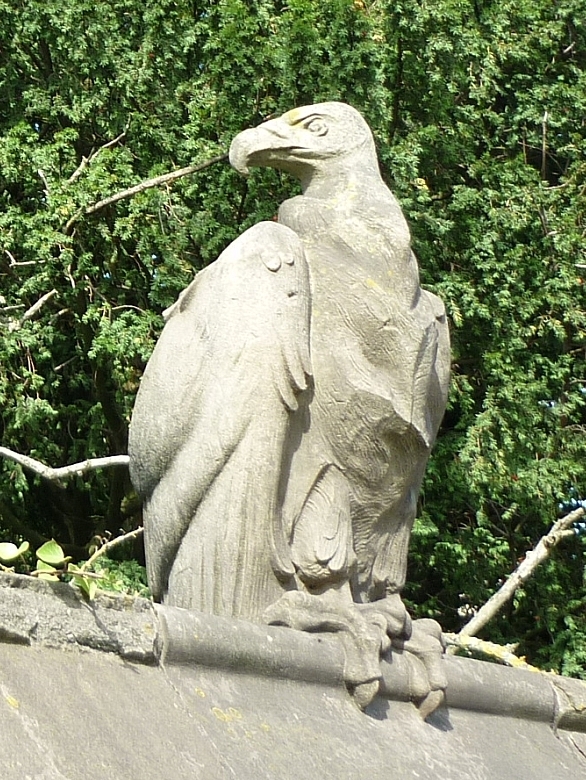 Vulture and Panther on the Animal Wall, Cardiff Castle, Wales by Alexander Carrick (1882-1966). 1931. So popular was the Animal Wall that a further six animals, carved by this eminent Scottish sculptor, were added when the wall was relocated and extended in the early 20c. In addition to the creatures shown here, Carrick carved a beaver, a pair of racoons, an anteater and a pelican. 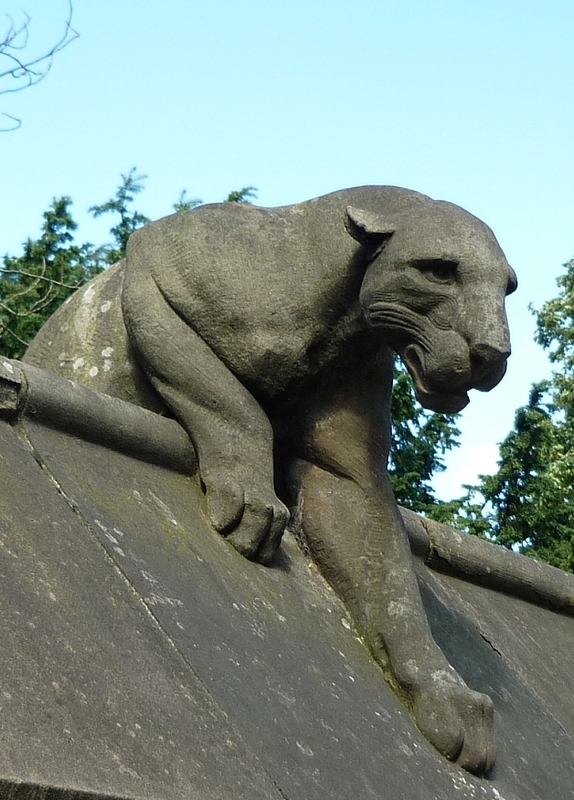 Although executed in the same humorous spirit, either utterly uninterested in passers-by or in a few cases (like the panther) about to come right over the wall, they are distinguished from Nicholls's original carvings by not having glass eyes. Interestingly, when the National Museum of Cardiff and the V & A in London held a centenary exhibition for Burges in 1982, one of the exhibits was of 9 model plaster casts for the wall, "probably by Thomas Nicholls," and it included not only the two shield-bearing lions but also "two lionesses, a bear, a wolf, a beaver, a hyena and a pair of baboons" (Crook 51; emphasis added). 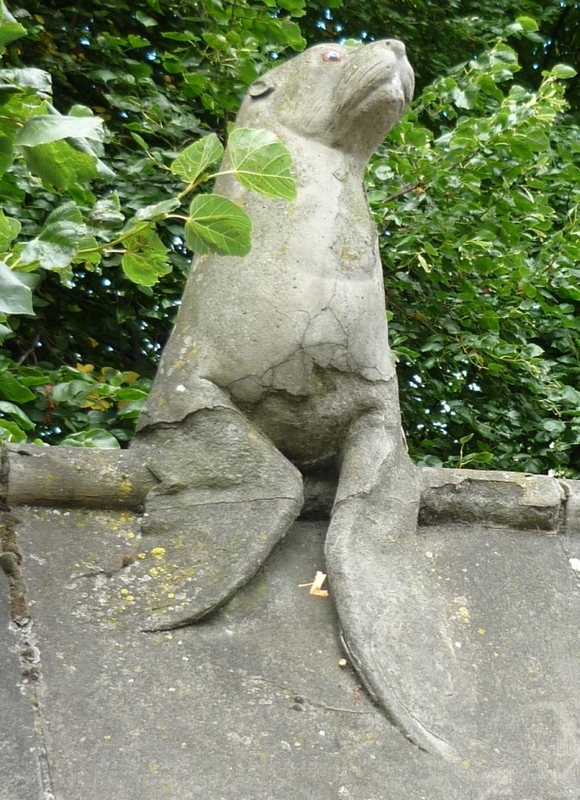 Nicholls's beaver, modelled but never carved, may have inspired the later sculptor's, although most if not all of these creatures do feature in the castle's interior decoration as well. Carrick did not generally undertake animal sculpture, but made an excellent job of these. "Cardiff Castle's Animal Wall under Repair." BBC: South East Wales. Web. 26 November 2011. Crook, Joseph Mordaunt. The Strange Genius of William Burges, "Art-Architect," 1827-1881. Cardiff: National Museum of Wales, 1982. McGinlay, Jamie. "Alexander Carrick, Scottish Sculptor,1882-1966." Alexander Carrick website. Web. 26 November 2011. "ST1876: Animal Wall — First Lion." Geograph. Web. 26 November 2011. Williams, David. About Cardiff: History, Heritage (etc.). Ed. Steve Benbow and Peter Gill. Cardiff: Graffeg, 1988.